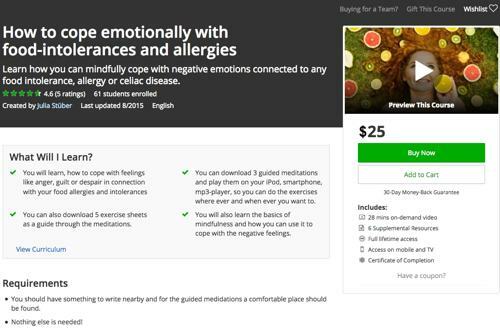 I recorded and uploaded a video course to Udemy about how to cope with the restrictions on an emotional basis that everyone experiences who is affected with food allergies, food intolerance like lactose or histamine as well celiac disease. There are tons of stuff and knowledge out there on the internet about allergies and intolerances like what to eat and what not, which restaurants are recommended, how to get a diagnosis etc. But I didn’t find any help on how to cope with the emotional turmoil that will hit you inevitably after the diagnosis. For example: Someone without celiac disease will never understand how painful it can be to smell the fresh bread from a bakery (it actually made me cry six months after my diagnosis). That is why I made this course to help you coping with the three major emotions connected to allergies etc: despair, anger and blame. The course is divided into three parts. In the first part I introduce you to the three major emotions. The second part is all about mindfulness as this is in my experience the best way to overcome negative feelings. The last part is full of exercises and four guided meditations. I hope I can give you a little support with this course!